This Thai recipe for lime roast chicken is super-delicious. 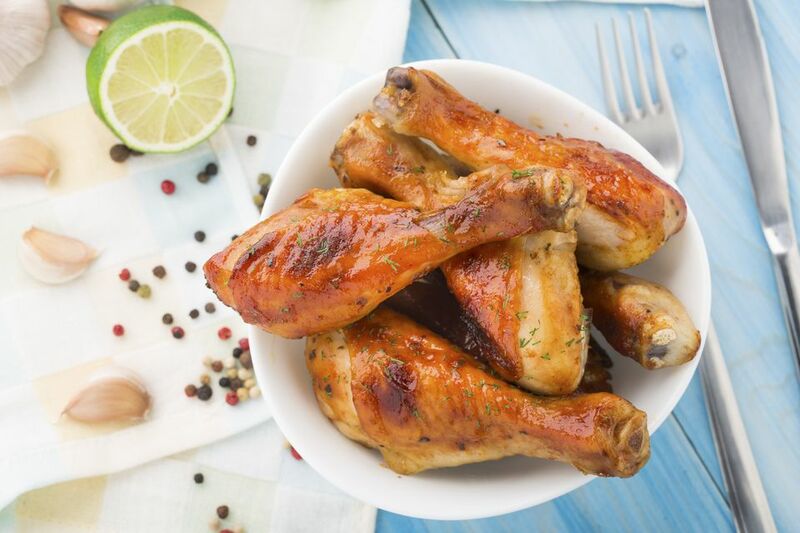 With crispy skin and tender meat beneath, you'll love the sweet lime flavor of this roast chicken, which makes a perfect meal to serve for any social gathering, as well as for everyday meals. Add as much or as little chili as you like - the lime sauce will still taste just as sweet! Preheat oven to 350 F. Empty cavity of chicken, rinse and pat dry. Place chicken in a deep roasting pan or casserole dish with a lid, or foil for cover. Place marinade/sauce ingredients in a sauce pan and stir over medium-high heat until it reaches a light boil and sugar dissolves. Reduce to minimum, stirring occasionally for several minutes, until sauce thickens slightly. Pour 1/3 of this sauce over chicken. Thoroughly coat the chicken by spooning it over. Reserve remaining sauce for later. Add 1/4 cup stock to the bottom of the roasting pan, then cover and place chicken in oven 1 hour. Remove from oven and use a ladle to spoon juices from the bottom of the pan over the chicken. Cover and return to the oven 1 more hour. Remove from oven and spoon 2 to 3 more tablespoons of the lime marinade/sauce you reserved earlier over chicken (the sauce may have become thick by this time, almost like a syrup; this is fine - it will "melt" when it touches the hot flesh of the chicken. There should still be moisture (juices) in the bottom of the roasting pan - if not, add 1/4 cup more stock. Cover and roast until inner flesh is well cooked (30 minutes to 1 hour, depending how large of a chicken you're roasting). Finally, uncover chicken and return to oven 15 minutes, until skin has turned golden-brown. Using a ladle, scoop out 1/3 cup of the juices from the bottom of the roasting pan and add to the reserved lime sauce. Place over medium heat, stirring occasionally until sauce is warm. Taste-test it, adding a little more sugar, if desired, or a little more fish sauce if not salty enough. Add more fresh minced chili or cayenne pepper if more spice is desired. To serve, either place the whole chicken on a platter, and pour the sauce over or serve it on the side. OR, place chicken on a chopping board, and chop it into pieces (as shown). Place the pieces on a serving platter. Pour sauce over, then top with sliced spring onions. Enjoy! When roasting chicken, always check to make sure there is some liquid in the bottom of the pan (a little water or stock can be added as needed). This will ensure a more tender roast. To test if chicken is done: Slip a knife into several of the thickest parts of the chicken (the drumstick, or just under the drumstick are good places). If the meat near the bone is white and the juices run clear, it is done. If you see red meat and/or red juices, the chicken requires another 15 to 30 minutes.